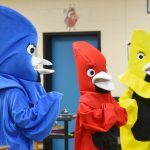 The Yellow Jessamine Garden Club and the Harmon Park Birds visited East Elementary School on May 11, 2018 at 8:30 a.m. 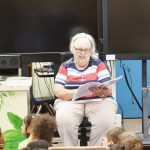 The Harmon Park birds “flew” in to the school and Glenda Campbell read a book entitled, “My Forever Home” written by a member of The Yellow Jessamine Garden Club. This book is about a little blue bird that makes her home at Harmon Park, here in Dillon. She makes this place her home because it has everything she needs, like food, shelter, water and a place to raise her young. Her home is a yellow birdhouse at Harmon Park. Even though, she has everything she needs, she is missing one thing; friends. She decides to fly around Harmon Park and meet new pals. She meets a red bird and a Carolina Wren among other friends. All of the birds and animals love interacting with the children at the play area. All of these animals adore the park! There is only one thing that makes them upset. LITTER! The HP birds encourage everyone that attends the park to place trash in proper containers and recycle when possible. Miss Bluebird and her friends are still living in Harmon Park and inspire all people to place birdfeeders at their homes. 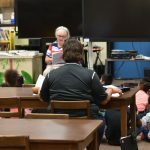 After the reading, coloring pages were dispersed to each student. 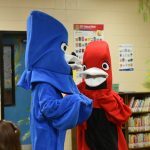 The students were excited to see the life-size birds and were interactive throughout the reading of the book. 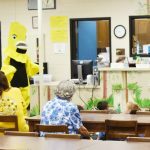 The Yellow Jessamine thanked Principal Shannon Berry and staff for allowing the YJGC Harmon Park birds to read to the school. This book was written around the theme of the GCSC President Donna Donnelly; Birds of a Feather, Garden Together. It was also written to promote bird habitats and recycling. (NCG and GCSC Objective: Encourage the love of all phases of gardening work among youth).